Fchat is a tool that searches a computer hard drive for Facebook chat messages or silently captures Facebook chat as it occurs. An HTML report file is created containing the located/captured messages, sorting them by date and time. Unicode is supported (i.e. different languages) and converted to the original text. Fchat is useful for recovering your old Facebook live chat conversations or or logging/saving your own. ıt has been tested on Windows XP, Windows Vista, and Windows 7. It should run fine on Windows 2003 Server but will not run on Windows 9x and prior. 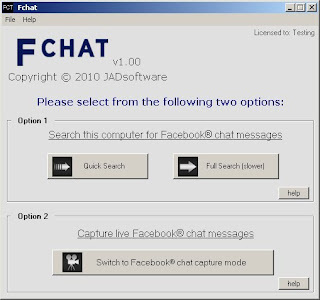 A demo version of Fchat can be downloaded from JADsoftware.com but only up to 10 chat messages will be saved to file in “demo mode”. Fchat is commercial software and a license needs to be purchased to “unlock” the demo version of Fchat for full functionality.